Cruisin’ For Awareness Event « Big Squid RC – RC Car and Truck News, Reviews, Videos, and More! If you are in the Midwest, and you are into RC cars or Full Scale cars, have we got an event for you! September 9th, 2018 we will be at the Cruisin’ For Awareness event. This is an RC event along side a full size car show event. Come drool over all the awesome show cars, and then watch all sorts of RC demos like Drag Racing, Long Jump, Demo Derby and more! There are also raffles and prizes and tons of stuff to do. 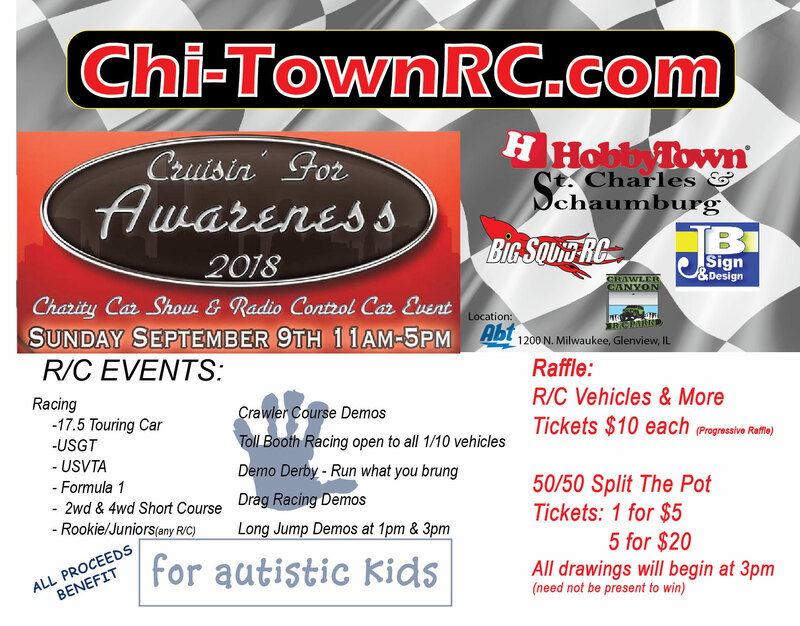 Big Squid RC will have a tent out there giving away stickers, selling t-shirts and just hanging out with the Chi-TownRC folks. Come on by and say hello, there is a little something for everyone there. Click the image for the full size image with all the details.